■ Whenever possible, an adequate vascularized flap of perinephric fat for subsequent obliteration of the diverticular cavity should be maintained (Step 9). ■ If a more substantial excision of renal parenchyma is needed or partial nephrectomy anticipated, vascular clamping of the renal hilum may be necessary. When utilizing a laparoscopic Satinsky-type instrument, en bloc hilar clamping may be performed. This requires mobilization of the periureteral package off the psoas fascia, continuing the dissection up to the caudal border of the hilum. 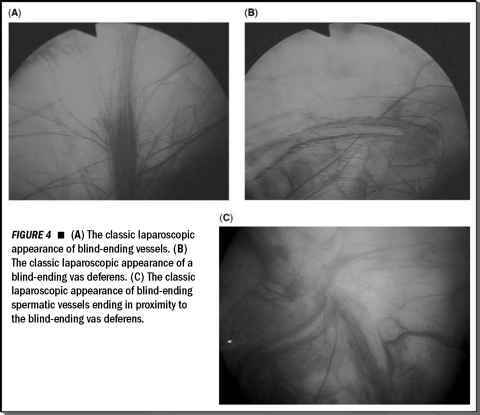 On the left side, care must be taken to identify and preserve lower pole renal vessels and lumbar veins. The anterior and posterior aspects of the renal hilum must be freed completely. Lastly, a window above the hilum between the adrenal gland and upper medial aspect of the kidney is created. An additional trocar is placed in the ipsilateral lower quadrant for entry of the vascular clamp. Alternatively, selective arterial clamping using either Bulldog-type or Satinsky-type clamps requires complete exposure of the main artery and all accessory arteries.